Where’s the L in Chicago? 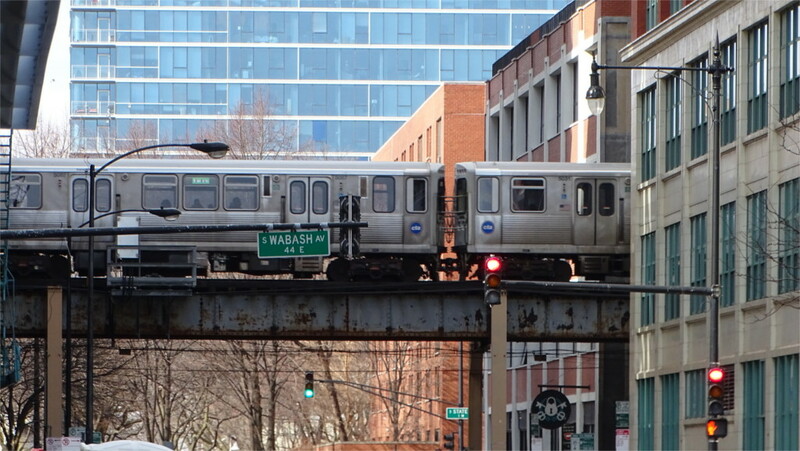 I wonder how many movies I’ve seen which show the elevated trains of Chicago. The Blues Brothers, The Fugitive (the one with Harrison Ford on the run), Ocean’s Eleven, While You Were Sleeping, to name just a few. So the bleak look of the parking lot below the century old tracks which you see in the featured photo didn’t come as a surprise. One of the amazing things about the USA is that the transport infrastructure is as old as it looks. The elevated tracks were finished in 1897! What do you call it? The Chicago Tribune gives you the definitive answer: the L is preferred over El. How often do the trains run? Jake’s (John Belushi’s) question was answered by Elwood (Dan Aykroyd) in The Blues Brothers: "So often that you won’t even notice it". That’s right. Before I finished cursing myself for fumbling a shot of a train passing the intersection in the photo above, the next one came along. The electrical power to the train is, famously, supplied through a third rail. If you are wondering about it, then it is supplied at 600 Volts. Although, as Billy Crystal says in Running Scared, as he chases a bad guy along the rails, "It’s not the volts, it’s the amps". Yes of course. Thanks for the comment.